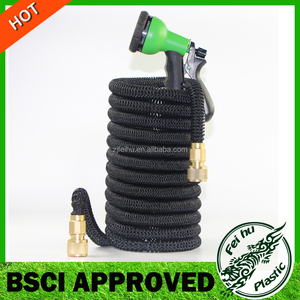 2:The expandable garden hose is lightweight, easy to work even a child. How the expanding garden hose work9 1:Connect the expandable garden hose connector with your faucet. 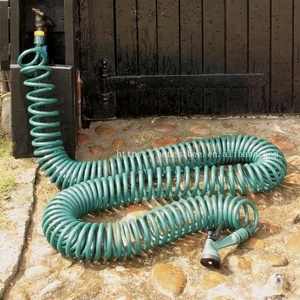 2:Turn on the water, then the water will fill and expand the garden hose. 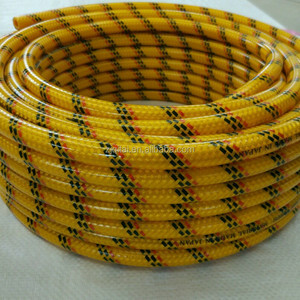 Ningbo Gardener International Trading Co., Ltd.
PVC Spray Hose pvc coiled water pipe super spray hose The PVC hose is widely used in pneumatic tools, pneumatic washing apparatus, compressors, and used for conveying oil gas under normal working condition in the family. 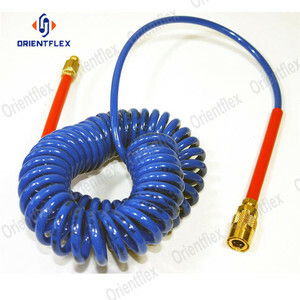 Braided Spray Hose 1.Made with high-quality PVC and strong reinforced yarn 2.Strong peeling adhesion between yarn and inner-outer tube 3.Stable against kinking and twisting under working pressure 4.High resistance to corrosion,aging 5.Working Temperature:-20C to +70C(-3F to +159F) No. Inner Diameter (inch) Inner Diameter (mm) Length (m/roll) Working Pressure (bar) Burst Pressure (bar) 1 1/4'' 6.5 100 0~40 100~140 2 9/32'' 7.5 100 0~40 100~140 3 5/16'' 8 100 0~40 100~140 4 1/3'' 8.5 100 0~40 100~140 5 3/8'' 10 100 0~40 100~140 6 1/2'' 13 100 0~40 100~140 Special request also acceptable. c:) characteristics: 1: It is made from special synthetic rubber, and has the function of oil-resistance, hot-resistance and aging-proof. 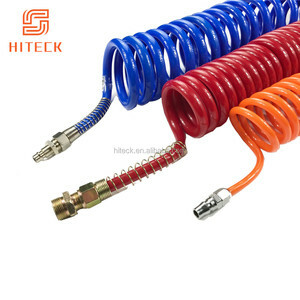 2: a:) structure of high pressure steel wire spiralled hose It is made of internal rubber, middle rubber, 2,4 or 6 layers of wire-wound, and external rubber. b:) usage: It is mainly used for Mine hydraulic support, oilfield exploitation, object construction, lifting transport, metallurgic forging, mine equipment, ship, injection molding machinery, agricultural machinery, and so on. 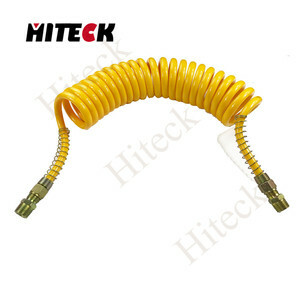 EN856 4SP Inner Tube: Oil resistant synthetic rubber Reinforcement: four spirals of high tensile steel wire Cover: Abrasion and weather resistant synthetic rubber Temperature range: -40&#8451; to +100&#8451; Application: high pressure service with petroleum based hydraulic fluids, hot oil, grease, lubricants and crude oils, air and water. 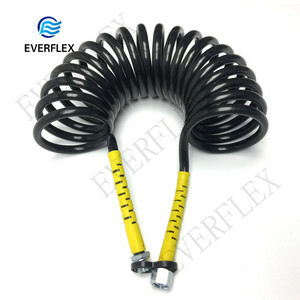 SAE 100R9 Inner Tube: Oil resistant synthetic rubber Reinforcement: four spirals of high tensile steel wire Cover: Abrasion and weather resistant synthetic rubber Temperature range: -40&#8451; to +100&#8451; Application: high pressure service with petroleum based hydraulic fluids, hot oil, grease, lubricants and crude oils, air and water. SAE 100 R12 Inner Tube: Oil resistant synthetic rubber Reinforcement: four spirals of high tensile steel wire Cover: Abrasion and weather resistant synthetic rubber Temperature range: -40&#8451; to +100&#8451; Application: high pressure service with petroleum based hydraulic fluids, hot oil, grease, lubricants and crude oils, air and water. 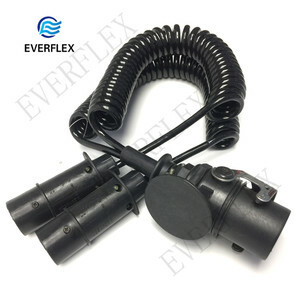 Ningbo Enovative Garden Technology Co., Ltd. If you're still unsure about the type of pressure cleaning machine you need, please contact our sales team. To make sure you choose the ideal power washing machine for your jobs, contact us for more details. Any parts replaced under this warranty will assume the remainder of the part's warranty period.